Totally redesigned for 2008, the Audi TT features modern, less polarizing styling and grows in size over its predecessor. 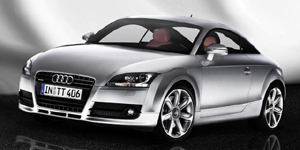 Available in roadster and coupe bodystyles, the Audi TT offers a choice of two trims. Quattro all-wheel-drive comes with the 3.2l V6 engine only, while the 2.0T drives the front-wheels only.